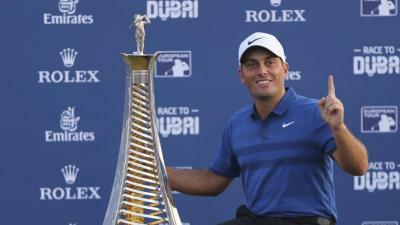 ROME – Italian golfer Francesco Molinari was officially crowned champion of the year-long Race to Dubai competition and European number one after Ryder Cup partner Tommy Fleetwood couldn’t take victory at the DP World Tour Championship on Sunday. Fleetwood had to win the tournament in Dubai to harbour any hope of toppling Molinari and retain his title but finished eight strokes back in joint 16th. A third-round birdie-less 74 effectively nullified the Englishman’s chances going into the final day and Molinari’s coronation was confirmed after Fleetwood completed his round one stroke behind the clubhouse leader. “It’s incredible,” Molinari said, reflecting on his achievement. “Now I’m going to have time to sit down and relax and really think about the last few months.” And what a last few months it has been for the Italian. A huge win in a star-studded field at the BMW PGA Championships was quickly followed by his first major win at The Open, before he produced three days of faultless golf in Paris to spearhead Europe’s assault on the Ryder Cup. Many are expecting a similarly spectacular array of performances from Molinari in 2019. He has proved his major-winning capabilities and his Ryder Cup masterclass was nothing short of remarkable, the most consummate individual display the competition has seen for quite some time. Such hype, unsurprisingly, doesn’t seem to have gone to the Italian’s head though. “It’s going to take a while to get used to, but at the same time I’m looking forward to next year,” he said. Rest assured, Francesco, so are we.